When it comes to pressure cookers one of the most well-known brands in the market place is Fagor. Their cookers are well known for the quality, style, reliability and efficiency. If you are planning to get a pressure cooker, you must consider the models from Fagor. It is not just a standard cooker that you must pick, Fagor has a quite a range to choose from. Besides, it is not just a single cooker model, but even matching sets that you can purchase for varied pressure cooking style and techniques. Fagor is all about great looks blended with performance and convenience. It is this unique combination that separates Fagor products from the rest of the brands in the market. Every Fagor pressure cooker is designed with one goal in mind  ensure rapid cooking with efficient use of power in a safe manner. With Fagor, you are not only assured of quick cooking times, but also the fact that the nutrients in the food are not lost. The rapid cooking ensures that the food gets cooked, but the essential nutrients in it remain intact. The locking handle in these cookers comes with a special safety lock which ensures that the lid does not blow out under the high pressure inside the cooker. This ensures a safe cooking environment. This is a very special feature in Fagor cookers. There is a spring dial on the lid which can be adjusted to high pressure or low pressure. Some food stuffs do not require a very high pressure like vegetables. These can be best cooked under lower pressure. Fagors spring value technology supports this feature. Sometimes, regardless of what pressure you are working with, the pressure inside the cooker can rise to dangerous levels. It this is not releases immediately, it can be quite dangerous. Hence, Fagor pressure cookers come with an automatic pressure release design. This helps keep the cooking safe. Fagor is not just a safe cooker, but also a very efficient one. The exterior finish of the cooker is flawless mirror finish on a stainless steel body. This makes it easier to clean the cooker and also retain its new shiny looks for many years. The body is made from 18/10 gauge stainless steel. This makes the cooker sturdy enough to handle high pressure; as a result these cookers are quite durable. The base of the cooker has a layer of aluminum enclosed between layers of stainless steel. This design allows the base to heat up quickly and uniformly. This is one of the reasons for the efficient cooking delivered by the Fagor pressure cookers. Each of these brands has the same reliable safety and cooking features mentioned above. So regardless of which model you choose you are bound to benefit from Fagor technology. While from a features perspective, all the models are similar. The real difference is in the designs and some unique features in each model. The Elite models come with an easy one touch pressure cooking feature. The Futuro models have a unique design with two side handles instead of one long handle. The benefit of this design is that these cookers can be easily stored in the kitchen and also placed in the dishwasher. Besides, the Futuro models also come with a steamer basket to cook two dishes at the same time. The Futuro cooker also comes with Tastefully Under Pressure cookbook which has loads of interesting recipes for pressure cooking. Pot - The mirror-finish, solid, stainless steel bellied pot has an encapsulated, 3ply, flat base which allows it to work well on all domestic cooking surfaces including gas, electric, ceramic and induction stoves. Lid - The lid is made of the same heavy stainless steel as the pot. It has a raised indicator next to the top handle which enables you to align the lid easily with a second notch indicator on the bottom handle. Upper lid handle - This handle is not only used to remove the lid from the pressure cooker pot, it also holds vital components that are crucial to the workings of the whole appliance. Pot base handle - The black, heatproof handle is very durable so can manage a lot of weight when carrying the pressure cooker i.e. from the stove to the cooker after filling with high volumes of water. When turned clockwise, it interlocks with the upper handle to form an airtight environment inside the pressure cooker. Gripping on handle - The pressure cooker alone is quite heavy so the support grip on the handle is required to allow increased stability and security when carrying or moving it. Operating valve - This valve has three settings; a pressure setting, a steam release setting and an unlock position. Silicone gasket - In the underside of the lid, there is a silicone gasket which allows an airtight seal to form when the lid is locked shut. A faultless and correctly placed gasket is vital for the safe use of a pressure cooker; do not use if the gasket is not properly positioned and replace it immediately if it is damaged. Thermo heat conductive base - The bottom of the cooker comprises of three bonded layers of metal; the innermost layer, which needs to be safe when having contact with food, is stainless steel. The second layer is aluminium, which is an excellent heat conductor and is sandwiched between the inner and outer layer due to its harmful properties if it gets in contact with food. The aluminium is the constituent which allows this pressure cooker to cook in 70% of normal cooking time as it enables more heat distribution and therefore cooks faster. The third magnetic layer is stainless steel and this allows the pressure cooker to be compatible for use with induction cooking. Visible pressure indicator - This is the yellow tipped rod on the top of the lid handle which indicates if there is pressure inside the cooker and whether the pressure has been released. 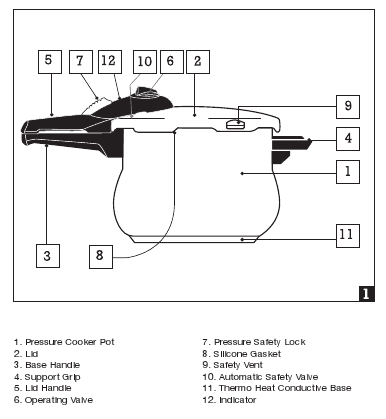 Safety valve - This pressure cooker is great because of the triple safety mechanism features. Already mentioned is the locking handle but this safety valve also ensures that the pressure cooker cannot be opened if there is still a pressure build-up within the cooker. Safety vent - There are also two independent pressure release valves if there is excess pressure built-up inside the pressure cooker. If there is excess pressure, the steam is released through a safety vent in the rim of the lid. The second mechanism is located in the handle of the pressure cooker and this cut-out vent is only operational in emergencies so should not be giving off steam during everyday use. In the event that both of the pressure release systems become blocked, for example due to overfilling, then the pressure will rip the gasket and escape through this vent. The fagor pressure cooker allows you to safely cook healthy meals without having to add oil within minutes. The triple layer base construction allows even heat distribution preventing hotspots and burnt food and the pressure cooker body is dishwasher safe to save you even more time. It is clear that Fagor is a great brand in the pressure cooker space. Its products are safe and efficient. They are designed to deliver the best performance. Besides, with a wide range of brands and capacities, it is certain that you can find the right Fagor for your kitchen. Fagor also offers a combi set with each of these brands, so if you like a particular design, you can purchase the entire set for that. If you're looking for 3 in 1 cooker in which you can have rice cooker, slow cooker and pressure cooker all in 1 place then buy this Fagor Multi Cooker. The electric multi cooker is an exceptionally versatile addition to any busy kitchen.